Victory Day in Turkey falls on August 30 each year and celebrates the Turkish victory over the Greeks in 1922. 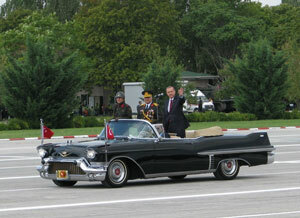 Many will attend military parades and ceremonies for monuments to Mustafa Kemal Ataturk. The Turkish flag is put up on buildings, offices and people's homes celebrating this day. Many military schools will have graduation ceremonies on this day. This day celebrates the Turkish victory in the Battle of Dumlupinar in August of 1922 over the Greek forces. This day became a national holiday in 1935. Provides the dates for holidays for the calendar year for Turkey.